"The poor have typically been concentrated in big cities and rural America. Increasing poverty in the New York metropolitan area’s historically affluent suburbs mirrored a national trend detailed in the analysis, “Confronting Suburban Poverty in America” by Elizabeth Kneebone, a fellow at the Metropolitan Policy Program, and Alan Berube, a deputy director of the program. "The first decade of the 21st century was a tipping point, the authors wrote. Suburbia, they said, is now home to the 'fastest-growing poor population in the country.'" Glen Cove??? You have to be kidding! 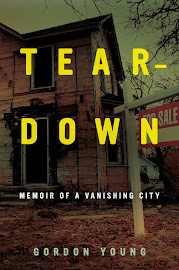 The current state of Detroit has been a revelation for most of America in the shadow of the foreclosure crisis. This despite the fact that it has been unraveling for almost 50 years. Similarly, impoverished suburbs are nothing new to Troiters or 'toids. Beecher, Mayfair, Lavelle Rd. corridor, that weird neighborhood south of Flushing Rd and west of Ballenger (sorry GG), Bendle, hell, most of Burton, Gaines, Mt. Morris, Montrose, and various assorted pockets of the townships have been in decay for a long, long time. The fact that Flint and other Michigan cities had an EFM appointed years ago, and supposedly Detroit wasn't as bad and didn't need one until now, illustrates that the entire "Flint is worse" myth has been politically perpetrated for decades. Now Kevyn Orr is finally telling us how bad Detroit really is financially. That would have been nice to know when corporations and other businesses abandoned Flint but stayed in Detroit. Michael Moore was right about this aspect all along, although he also believes in truly unsustainable solutions like printing money without creating wealth to back it up. As Radiation Sickness says, sorry GG, once again. When the guy is right, he's right. "...that weird neighborhood south of Flushing Rd and west of Ballenger" . If you're referring to the neighborhood with Francisco St. on it, I concur. Lived there in the late 1960's. Mom called it little Burton. Even in Flint's hayday, that was a dumpy neighborhood. It still has dirt roads. But being downwind of the water treatment plant, could you expect much from its real estate value? It was a weird neighborhood,and not in a good way,usually. Us Longfellow kids were forbidden to cross Ballenger Highway,which meant that we naturally did. First to go to the Ben Franklin store on Flushing for "friendship rings" , bean shooters ( and navy beans at the little grocery store next door until they refused to sell to us after a time),slingshots etc. The old lady clerks were on our case constantly. Black and white tiles lay to the south of the river, and a wild stretch of Flint river trails to the north. Smoked my first cigarette there ( Kents stolen from my buddy's mother's purse). It was the heyday of Banana bikes,and girls, and a good place to fight....or to get the crap beat out of you. The natives were not friendly. You may go there on a new Schwinn,and return with a welt and no bike at all. We would go all the way down the river to the I-75 bridge- where we once speared carp and sold them for a quarter to the guys building the little par 3 golf course for the apartments there. The spear heads coming from that hardware on Chevrolet near the Ambassador Bar, and the shafts from our mother's brooms that we sawed off.......not a good thing. Oh, the "glove factory" across from Sunset was also a cool place. Industry on parade. A magic place, seemed like a different world. Our family used to go to the shopping center that backed up to Hatherly Avenue, which my father always said used to be called Bagley Avenue, for which the possibility of extending it all the way through was truncated when they built Mott Park. There were a lot of good people that owned those businesses, like the Gaines and Underhills. It was kind of a strange subdivision, one built on wells, gravel streets, and fewer building code restrictions. I never really went there without a parent, so I was never scared. That was the selling point about the City of Flint for many years, that the subs were better built.